South Dakota Public Broadcasting is one of South Dakota's most valuable resources. We make personal impact on individuals on a daily basis through Radio, Television, Internet and Outreach. SDPB is South Dakota. 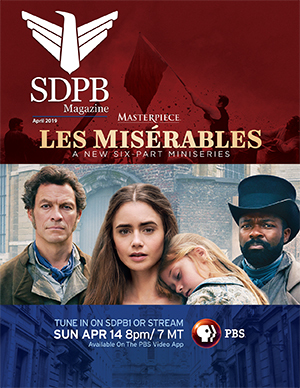 SDPB is a multi-media network owned serving all South Dakotans. SDPB TV is 3 channels of programming, averaging over 50 hours a month of locally-produced shows. SDPB Radio is 2 channels of programming, including over 36 hours per week of locally-generated music programming. SDPB.org serves over 20,000 visitors per month with more than 70,000 page views of fresh, unique content. SDPB Education and Outreach touches young and old alike in one-on-one, personal interactions. SDPB provides access to democracy. We offer citizens news, information, debates, documentaries, legislative action and more. SDPB presents democracy in action with Statehouse: the state's ONLY comprehensive coverage of the South Dakota Legislature, serving thousands of citizens via Internet, Television and Radio. Legislators and citizens alike use SDPB's podcasts and live streams to stay up to date with current legislative happenings, serving up hundreds of thousands of media clips each session. SDPB is the only news operation, commercial or non-commercial, that has staff in Pierre every day that the legislature is in session. SDPB informs the electorate by making time available to candidates free of charge and offering opportunities for candidates to debate in prime time to a statewide audience. SDPB's Statehouse News Update Service provides, free of charge, daily packaged reports of legislative activity to commercial radio stations across the state. Dakota Midday is the only statewide daily, interactive discussion on radio that brings the newsmakers to the microphone to talk about events and issues. South Dakota Focus is a weekly public affairs program presenting the opportunity for in-depth discussions. SDPB is the home to South Dakota High School Champions. Our unique partnership with the SDHSAA makes us the sole entity to feature South Dakota's best and brightest athletes, scholars and artists in competition and performance for state-wide audiences. And high school media students from across the state learn by participating in the productions. SDPB's largest audiences tune in for exclusive live coverage of all high school football, volleyball, wrestling and boys and girls basketball championships. SDPB provides public access to ALL types of South Dakota high school achievement, including championships in other sports (track & field, cross country, cheer & dance, tennis, golf, rodeo), arts (All-State chorus, band, one-act play, etc.) and academics (debate, oral interpretation and more). SDPB is the arts. SDPB's on-air and online network gives ALL South Dakotan's cost-effective access to our finest indigenous and visiting performing artists, regardless of means or geographic location. SDPB's coverage makes South Dakota's arts dollars go farther by bringing the performing arts of all kinds to even the most remote corners of the state. As South Dakota attempts to recruit businesses and professionals to the state, expectation for access to the arts is increasing sharply. SDPB is our state's most cost-effective vehicle for arts exposure. SDPB captures and distributes music of South Dakota's top musicians (SD Symphony, Black Hills Symphony), and gives free, on-demand access to top visiting musicians, like The Dakota Sky Piano Festival featuring up-and-coming, world-class pianists. SDPB airs All-State High School Chorus & Orchestra, All-State Band, All-State Jazz Band and the Elementary Honor Choir to a statewide audience yearly. We give opportunities to young and old to experience classical, jazz, world, folk music, and other genres that do not receive widespread attention in the commercial world. The voices of South Dakota are highlighted in specials like Red Willow Band: Reunion and in series like No Cover, No Minimum. We reach out to thousands of parents, teachers, caregivers and libraries to talk about literacy, family, health and more, making South Dakota's Education dollars go farther. In 2009 SDPB distributed nearly 18,000 books. Head Start programs receive free children's books as a part of SDPB's Ready to Learn program. SDPB presents breakout sessions for at least eight educational conferences in South Dakota each year. We also make numerous presentations at individual school in-service sessions, school-parent group meetings, and college teacher preparation programs. Over 2,000 educators in the state read the weekly electronic newsletter, Education Update from SDPB. This free service gives educators of all grade levels and subject areas the most current information about programs and resources available for use in the classroom. SDPB coordinates the Long Distance Dads program in a partnership with the SD Dept. of Corrections. The men enrolled in a parenting class at the Yankton Trustee Unit participate in Ready to Learn workshops. About 40 men participate in this program each year. We are the only statewide source of free GED educational television programming. SDPB works closely with the Department of Education to enhance and fulfill their professional development and curriculum goals with shows like Kids Quest, Our Statehouse, Dakota Pathways, Oceti Sakowin, and Bridging the Gap. SDPB produces Buddy's Healthy Habits which encourages kids to make good choices and adopt healthy living standards. And the programming SDPB airs has proven value to our young audience. More than 20,000 children in South Dakota watch educational, entertaining, non-violent programs every day. SDPB airs 67 hours of children's educational programming per week. Studies show that teenagers who watched Sesame Street in preschool had higher grades in English, math and science, enjoyed reading more and expressed lower levels of aggression than those who did not. Watching Super Why helped children from low-income families with poor reading skills and at risk for failure in school improve their literacy skills to match those of kids with more resources. Children from low-income families who watched as few as 2 episodes of Super Why scored 46% higher on standardized tests than those who did not watch Super Why. A July 2000 University of Kansas evaluation of Between the Lions concluded that kindergarten children who watched Between the Lions outperformed kindergarten children who did not watch by nearly 4 to 1 on measures of letter-sound correspondence, and concepts of print. A recent study conducted in two Mississippi communities, a Choctaw Indian reservation and urban students from economically disadvantaged homes, found that Between the Lions made significant differences in several key reading skills of children at high risk of reading failure. In kindergarten, recognition of letter sounds was almost 50 percent higher than the control group. First-graders who watched Between the Lions scored almost 21 percent higher. We partner with the Sanford Lab at Homestake to share information about the work being done at the lab. With Science Cafes we bring science experts into free public events to help people of all ages learn more, firsthand, about science and nature. SDPB produces documentaries, like The Badlands: Nature's Time Capsule, to highlight the geographical and geological science and history unique to South Dakota. SDPB is history. We preserve the stories of each generation. Homefront: South Dakota recorded the memories of the WWII generation and put them online for everyone to access. Deadwood Songbook told the story of the early gold miners and the music and culture they brought to the Black Hills. Active Duty gives unique access to South Dakota National Guard unit serving in harm's way in Afghanistan. Documentaries like the history of SD high school football and girls and boys basketball. SDPB is diversity. We offer programming that celebrates our differences and our similarities. We encourage understanding and tolerance by exploring the lives and cultures of different kinds of people. Native American culture is highlighted in programs like Oceti Sakowin and Tribes of Dakota. Dakota Life tells the stories of our citizens, which promotes a unified South Dakota: a state where different kinds of people can live in harmony.